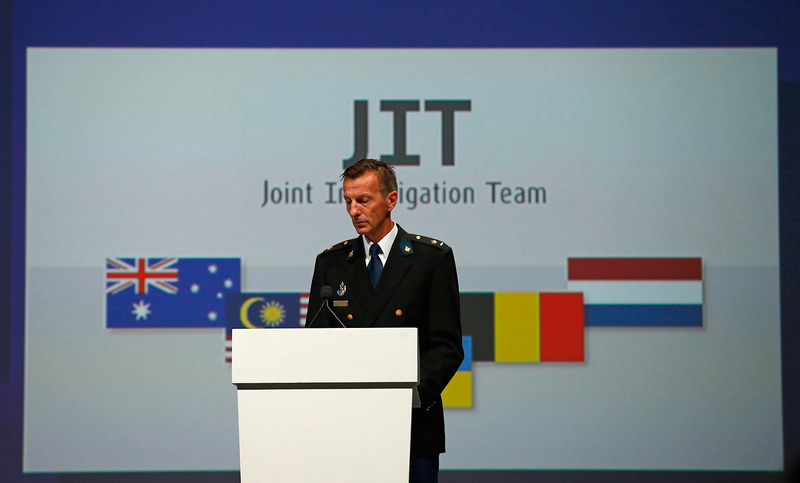 Wilbert Paulissen of the Joint Investigation Team (JIT) speaks on the preliminary results of the investigation into the shooting-down of Malaysia Airlines jetliner flight MH17 during a press conference in Nieuwegein, Netherlands, Sept. 28, 2016. Findings so far show the cause of the disaster, not who was responsible. Representatives of the Dutch-led Joint Investigative Team (JIT) researching the crash of MH17 in the Donbass region of eastern Ukraine in July 2014 urged patience in attributing responsibility for the disaster at a press conference on Sept. 28 announcing the team’s findings after more than two years of investigations. Dutch prosecutor Fred Westerbeke, who heads the JIT, told reporters that the team has so far not identified any particular suspect, adding that it is too early to speak about their nationality or Russia’s potential involvement. The JIT report said that the team is "convinced of having obtained irrefutable evidence to establish that on 17 July 2014, flight MH17 was shot down by a BUK missile from the 9M38-series." According to the JIT, there is also evidence that the missile was launched from a farmland near Pervomayskoye, to the south of Snezhnoye, which was under control of separatist militias. "So far, the JIT has identified approximately 100 people who can be linked to the downing of MH17 or the transport of the BUK-TELAR," the report said. There is the need to have the full picture of who had ordered to transport BUK or shot down the plane and whether they made the decision independently or upon someone’s order, Westerbeke told reporters. The investigation into the MH17 crash may result in an international trial over the suspects, Westerbeke said, although it is also too early to speak about this possibility. On July 17, 2014, a Malaysia Airlines Boeing 777 passenger airliner traveling from the Dutch city of Amsterdam to the Malaysian capital of Kuala Lumpur crashed in the Donetsk region of eastern Ukraine, killing all 298 people on board. Most of the passengers — 193 people — were Dutch nationals. The strike of a ground-to-air or air-to-air missile was named as a possible cause of the crash. Ukrainian authorities and the militia of the self-proclaimed Donetsk People’s Republic accused each other of responsibility for the tragedy. On July 21, the UN Security Council called for an independent investigation into the disaster. Russia’s representatives have said on many occasions they are dissatisfied with how the investigation was carried out and that the data presented by the Russian side was ignored.